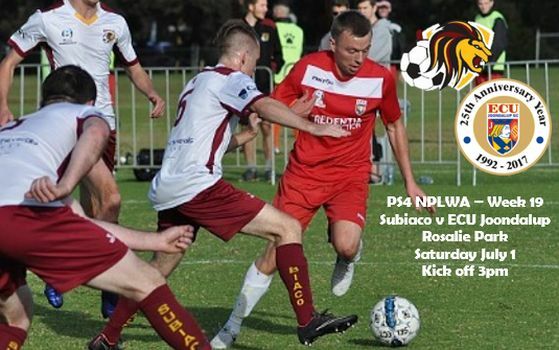 ECU Joondalup hit the road in week 19 of the PS4 National Premier League when they travel to Rosalie Park to take on Subiaco. Dale McCulloch’s side will be looking to kick start their season, and bounce back from last week’s loss at home by joint league-leaders Floreat Athena, on Saturday and assistant Coach David Tough said they are looking for a response from the players. “We’ve said for the last few weeks we need a win, but it’s time to get it done and we are looking forward to Saturday’s game and bouncing back, we’re not ones to make excuses, and we have every confidence in the squad. The Jacks have been hit by injuries this season, but Tough said he is not one to make excuses, and he has every confidence in the squad. “When you lose your top goalscorer and senior players it’s difficult, but we can’t do anything about, we need to roll up our selves and get on with it,” he said. Jacks winger Daryl Nicol said last week was a disappointing day, and it continues narrow defeats against the top sides. “Last week was another narrow defeat to one of the top teams which has happened to us all season,” he said. “What was particularly disappointing on Saturday was the fact we played with a man extra for the whole second half and never ever really looked like scoring. I think that probably comes down to missing key players at the top end of the pitch. Nicol played his first starting game for the club at Subiaco last season, and scored, he said he hopes for the same result on Saturday. “I remember the game well and I remember being particularly surprised at the set up at Subiaco, but the team performed very well that day and if we can get close to that level of performance again I’m confident we will come away with the three points,” he said. Subiaco are coached by former ECU striker Ian McMurray and he said they are a good side, but he is confident they can get a result and continue their good form. “ECU has a quality side with good players through the squad, and although results haven’t went their way recently, they are always dangerous and I know Dale will have them focused and determined for the match,” he said. In team news Gordon Smith will again miss for ECU, while Rory Feely is out for Subiaco with injury, but they do get back Alex Randell from suspension.